Drawings for Figure 732 — Lugged Butterfly Valve, Standard Configuration, 2" - 12"
Drawings for Figure 732 — Lugged Butterfly Valve, Standard Configuration, 14" - 24"
FNW cartridge style resilient seated butterfly valves are designed to meet the rigorous requirements of industrial applications such as pulp and paper, water purification, power and utilities, chemical/ petrochemical, food and beverage, OEM and HVAC. 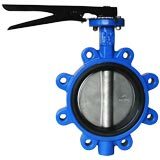 Each valve is manufactured in accordance with independent standards specifications and is 100% tested in both directions of operation to assure bubble-tight service for many years. Wafer bodies cast iron to 12", ductile iron to 24", and Ductile iron lug bodies to 24"